Living in Orlando, one cannot help but be aware that Yoga is one of the big fitness trends. Yoga is wonderful, and anything that keeps you active and flexible is a great thing. However, there is another low-impact (easy on your joints) exercise that I tend to recommend above Yoga for many people. Tai Chi. Tai Chi is an ancient practice that is most easily defined as a way of moving. It has been hailed throughout history as the “perfect exercise” because the health benefits are extremely high while the risk of injury is extremely low. Tai Chi is practiced by over 200 million people world wide, and it's practitioners vary in age from young children to elderly adults. Tai Chi is unique to most exercises because the focus is on developing one's qi (pronounced “chee”). In traditional Chinese medicine (TCM), the concept of qi is a major one. Qi is life force. All living beings have qi and the complete absence of qi leaves one dead. Qi is even present in the earth beneath our feet. Qi has many aspects and is constantly transforming. As such, if your qi is low you will feel sluggish and dull. However, when your qi is abundant you will feel alert and energetic, virtually buzzing with living possibilities. Tai Chi helps one to develop their qi, helping to improve mood and health. How this happens is often complicated and often filled with Chinese philosophical concepts that seem very foreign to most Westerners. However, modern science does see a great benefit to this form of exercise. In the last decade, researchers from the University of South Florida teamed up with Chinese researchers to compare the effects of Tai Chi on the brain. They separated elderly patients into 4 separate groups. The first walked, the second increased social interaction, the third practiced Tai Chi, and the fourth made no changes in their daily routines. At the end of the 40 day study, the results showed that the Tai Chi group had significant improvements in brain volume, which tends to decrease over time. Since then, there have been several other studies involving Tai Chi practices. Many of which showed significantly positive results. 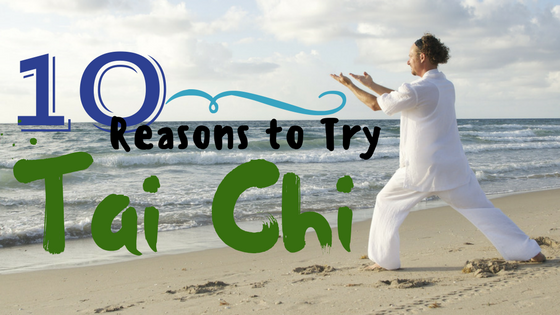 Without further ado, I'll share with you my top 10 reasons for recommending Tai Chi. Tai Chi uses slow, gentle, deliberate movements to increase flexibility, strength, and balance. This reduces the chance of falls and helps to reduce stiffness in the joints. The controlled movements also help to reduce joint pain, particularly in people with arthritis. Tai Chi uses your mind and body equally during it's postures. This engages the mind in a way that helps to reduce stress and anxiety, as well as promote feelings of well-being. The meditative state induced by the slow, deliberate movements, helps to benefit a large range of psychological wellness areas. Tai Chi's gentle, deliberate movements help you to focus on the moment. This helps keep you from dwelling on worries or anxiety. It's gentle and calming which helps to give one a since of peace. It also improves sleep which can help to lower stress levels as well. Not only does the physical exercise required in Tai Chi help one get to sleep, but Tai Chi has been shown to help improve the quality of sleep as well. Several studies have shown that people who participate in Tai Chi take less time to fall asleep, have fewer awakenings, sleep a greater amount of time, and feel more rested once awake. Not only is Tai Chi gentle enough to be safe for patients with cardiovascular issues, it also helps to improve cardiovascular health. Tai Chi increases circulation, improves blood pressure, aerobic capacity, and cardiac muscle strength. Scientists have actually found a remarkable increase in overall immunity in those who practice Tai Chi. These studies showed that people who practice Tai Chi are less likely to experience severe illnesses and are ill for shorter amounts of time. This is attributed to a combination of controlled breathing, slow movements, and a meditative mind state. Tai Chi has been shown to improve cognitive function in people of all ages. However, most notably it has shown to improve cognitive function even in Alzheimer’s patients. It's thought that Tai Chi can even significantly lower one's risk of developing dementia. A handful of the studies done involving Tai Chi have shown that Tai Chi has a definite and positive effect on insulin levels. Overall, Tai Chi was found to help increase glucose control, insulin receptors, and insulin receptor binding capacity. The controlled breathing and slow movements of Tai Chi can increase oxygen consumption. Over time, Tai Chi can even help to improve the breathing of asthma patients. A standard 30-minute session of Tai Chi burns roughly 150 calories. This may not seem like much, but with the added benefit of stress reduction, it is definitely a great weight loss tool as there is a connection between higher levels of stress and overeating. Tai Chi also boosts metabolism which helps to burn even more calories more efficiently. I hope I have given you an appreciation for this amazing and ancient practice. If you have any questions or comments about your Tai Chi practice, or if you are curious and have questions about how to get started, please let me know below.